Synopsis: A man stumbles upon a gumiho when he is in a cave, but the nine-tailed fox spares him since he promises to keep her secret. Nearly ten years later, the man breaks the promise cursing the gumiho and their daughter. The gumiho runs away with their daughter and becomes entangled with a lord whose daughter is suffering a strange illness which has a very peculiar…and deadly cure. The lives of the gumiho’s daughter and the lord’s daughter are entangled together. Can either one of them survive? Yay! 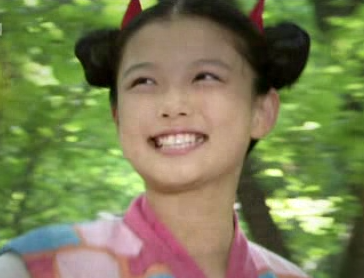 Kim Yoo Jung is back, and not just in this drama. The girl who played the sassy, younger Dong Yi is also starring in the epic war drama Road Number 1 with So Ji Sub and Kim Ha Neul. Really, she is the first reason I decided to watch this drama, and her acting doesn’t disappoint. And for clarification, the Lee Min Ho in this drama is not the Lee Min Ho from Boys Before Flowers fame. We open the drama with Jung Eun Pyo out searching for something. He happens into a cave where he finally finds what he has been looking for and something that he wasn’t as well. He manages to catch sight of a gumiho. The gumiho goes to kill him, but the man begs for mercy, to have his life spared. The gumiho asks if he can promise never to reveal that he has seen her. The man just keeps repeating for her to spare his life over and over again until he passes out. The next day, he wakes up and begins going back down the mountain when he comes across a beautiful woman. We then cut to a scene where we see the same woman the man came across (Han Eun Jung) who is taking a bath with her daughter (Kim Yoo Jung). 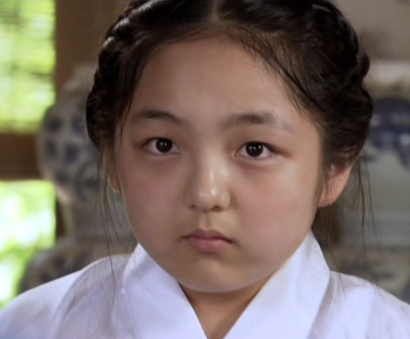 The child, Yeon, asks her mother if the gumiho then killed the man and ate his liver. Her mother replies that the gumiho had decided to trust the man. If a gumiho can be with a human for ten years without him mentioning that he ever saw a gumiho, then that gumiho has the chance to become a full-fledged human. Yeon then asks San Daek if the gumiho was able to become human, was the man good enough? San Daek flashes back to some not so great times with her drunken, gambling husband. She replies that she doesn’t know yet as the ten years will be up tomorrow. If nothing goes wrong that night, then she will be human tomorrow. The two are interrupted with the arrival of San Daek’s husband which worries San Daek greatly. We then cut to a scene where people are gathering at a lord’s home. People wonder if war has broken out, no, not war. The child of the house Cho Ok is deathly ill. Her face is covered in boils. A shaman dances outside while the father keeps drawing back a bow as if he is shooting arrows. The mother worriedly watches over her ill daughter. Finally, things come to a culmination and like that, the boils are gone and Cho Ok (Seo Shin Ae) looks to have made a full recovery to the astonishment and happiness of her parents. Yoon Doo Soon (Jang Hyun Sun) thanks the shaman (Chun Ho Jin), but the shaman says that it is too soon to thank him as Yoon’s daughter is cursed. This upsets Yoon who takes out his sword to strike down the shaman who replies that killing him won’t change Cho Ok’s fate. He then tells Yoon that before the rooster crows, there will be a sign of Cho Ok’s impending malady – the curse that she is under. The shaman then leaves. Her husband came home early because he managed to sell all the woven goods that San Daek had made. He then says that he is a lucky man to have a wife as skilled and beautiful as her. He also says that he is surprised that after all he put her through, that she is still as young and beautiful looking as when they first met ten years ago. San Daek said that her insides have gone black after all he’s put her through. He laughs and then comments on the foxes making noise outside. He then pauses and asks his wife if she wants to hear a horror story. This alarms San Daek greatly. She can’t believe that after all of these years, he is finally breaking the silence. He tells the tale of the gumiho and San Daek begins transforming. She has lost her chance with only one night left! It is ironic because her husband said if it wasn’t for the fox, then he would never have his lovely wife and their daughter. He turns and their is the gumiho he met ten years ago! She asks why he couldn’t keep his promise and calls him a worthless human. She goes to kill him, but can’t. After all the time they spent together, she just can’t kill him. Instead, she runs away. After she leaves, Yeon suddenly wakes up, eyes flashing like her fox mother’s and she chases after her. San Daek is surprised to see Yeon running after her. Yeon asks her mother why she is leaving her. San Daek says that she will never leave her daughter, but Yeon needs to go back to her father for just three months. Yeon refuses saying that San Daek always told her the thread must follow the needle. Well, San Daek is the needle and Yeon the thread, thus Yeon must follow where her mother goes. A group of bats (?) fly overhead and San Daek notices figures flashing through the trees. It is a pack of tigers! Yeon sees the tigers and faints. San Daek smiles, showing her fangs and picks up her daughter and runs from the tigers. Yeon falls off her mother’s back and almost gets eaten by a tiger, but San Daek manages to save her at the last minute and finally eludes the tigers. San Daek doesn’t want to part from her daughter, but her human daughter can’t live in the wilds of the forest and San Daek can no longer live among the humans after being so cruelly betrayed. She will take Yeon back to her father until her daughter turns 10 in three months and becomes a gumiho like her mother. San Daek’s plan goes awry when she gets back to her house and sees her husband hanging from the porch. He has killed himself. Well, guess you can’t blame him too much, both his daughter and wife ran out on him, plus he found out his wife was a gumiho. But still, suicide is never an answer. Yoon gets up the next morning and remembers the shaman’s warning about Cho Ok. He goes to see his daughter and sees his wife trying to pry open Cho Ok’s eyes. For some unknown reason, Cho Ok’s eyes are stuck together and will not open. Every time Lady Yang (Kim Jung Nan) touches Cho Ok’s eyes, her daughter winces and cries out in pain. Yoon immediately says that he will call for a doctor to help his beloved daughter. Meanwhile, San Daek and Yeon are resting in a cave. Yeon wakes up and says that she had a dream that she was riding on the back of a fox from tigers. The fox’s back was warm like her mothers. Yeon then asks about her father and San Daek tells her daughter that he is dead. The plague that is spreading overtook him and killed him. The doctor looks at Cho Ok and says that she has a strange malady. Yoon doesn’t wish to hear this and Cho Ok throws a fit saying she doesn’t want to be blind, making Yoon feel worse. He tells his daughter not to worry as he will do whatever it takes to help her regain her sight. San Daek and Yeon travel to a village that has been hit with the plague and find an abandoned house. Full of spiderwebs and spiders (shiver, there was a really huge black one). Yeon gets sick from eating mushrooms and her mother chastises the little girl for not showing them to her first before she ate them. San Daek feels badly for her daughter, knowing she must have been really hungry to have eaten those mushrooms. So that night, San Daek leaves Yeon alone in search of treasure. Apparently, gumihos either have an ability to find jade beads or an ability to find graves from which to get jade beads. San Daek quickly digs in the ground and pulls a jade bead from a corpse’s mouth. As she turns to leave, a young man stops her. Apparently there have been quite a few grave robberies of late and he is pinning them all on her (she’s only robbed this one recently). San Daek shows her true form and the two duke it out. The fight scene is okay. It is obviously a lot of wire work and sometimes it seems really fake, but oh well. The exorcist (Park Soo Hyun) manages to wound San Daek and she returns the favor. He falls off a cliff into water. If he survived, we don’t know. Yoon is out hunting and sees a flash of white. He shoots at it and finds the injured San Daek. He tells her to hold on while he gets help. When he returns with his men, she is no where to be seen. Lady Yang is cajoling the blind Cho Ok into eating the eyes of one of the animals Yoon killed. Cho Ok does not like the taste or texture and goes to spit them out, but her mother says that she needs to swallow it down, they are special sea urchins. Enter Kye Hyang (Im Seo Yeon) and her two sons who, I am not entirely sure, seem to be possibly Yoon’s illegitimate children. Kye Hyang says that she brought the boys to cheer Cho Ok up. The youngest, Choong Yi (Woo Min Gyu) is grossed out when he sees Lady Yang has bed Cho Ok eyes. This disgusts Cho Ok and she almost throws the eye back up. The eldest boy, Choong Il, remonstrates his little brother and says that there was no eyes. How sweet. 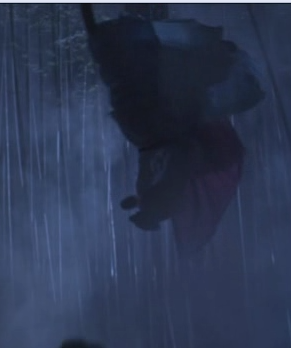 He is trying to protect Cho Ok whom I already despise, but oh well. Yeon is worried about her mother who is gravely injured. She tries to get a doctor but they won’t come if there is no money. Yeon asks her mother if she happens to have a jade bead on her person that they can sell for treatment. Yeon then sees the bead clenched in her mother’s hand. She goes to take it and San Daek says that she cannot. Yeon must forget about the bead as it can get them both in a lot of trouble. San Daek also says that you cannot trust humans. This shocks and upsets Yeon who still doesn’t know the real truth about her heritage. The poor girl is frightened enough as it is without her mom’s remonstrances. Yoon goes to the shaman for advice and does not like what he hears. The shaman talks in circles and riddles and calmly goes on like nothing is wrong, which upsets Yoon. The shaman said that parents and children are alike, so Yoon should be glad that the shaman is not a father as then he would never be able to propose what he is about to. The shaman tells Yoon that he must find a child (a girl) who was born on the exact same day of the exact same month in the exact same year as the exact same time as Cho Ok. The shaman then gives a box to Yoon and tells him that the item in the box will lead him to the child who will save his daughter’s life. Yoon then has his servant find all the children born on the same day as Cho Ok. So as not to be suspicious, his servant invites all the children. Yoon then feeds them a delicious feast and then promises them that whoever can untangle the puzzle, will be his daughter’s companion. A pretty good deal for poor children. They being working on the puzzle and Cho Ok complains about the stench. She is a rather demanding, spoilt, and horrible little brat. When one of the poor children makes a comment about her blindness, the girl goes ballistic and begins throwing food, upturning tables and beating on the other children. Yoon goes back to the shaman who tells him that he can’t interfere in the process. Besides, Cho Ok will be the first to see the child. Yoon wants to know how if Cho Ok can’t see. The shaman then replies whether or not they two children are fated to meet is unknown. Terrified that her mother might really die, Yeon takes the jade bead and goes into town to sell it. She meets a merchant who demands to know where she got it, but remembering her mother’s words, Yeon says nothing. The man then offers one nyang for it. Yeon also recalls her mother’s words not to trust anyone. She says no and demands five instead. This angers the merchant who says that she will be in big trouble if she is caught with it and he then tries to take it. Enter Choong Il and Choong Yi. Choong Il demands that the merchant give it back. The merchant is eventually cowed by the child and gives the bead to him, making a comment about Choong Il putting on airs for being an illegitimate child. This angers Choong Il who storms out with the bead. Yeon follows and thanks him for his help. He says that he pitied her, but when she holds out her hand for the bead, Choong Il yells at her for shoving her dirty hands in his face and keeps the bead. Yeon follows after him and demands it back so she can save her sick mother. Choong Il refuses and the two scuffle, eventually leading to Choong Il getting scratched. Kye Hyang sees her sons’ in such a state and immediately slaps Yeon and then drags her off with her to punish her. San Daek wakes and finds Yeon and the bead missing and frantically begins searching for her daughter. San Daek overhears women talking about the ruckus and finds out that her daughter was taken to the mistress’s place. At the Yoon household, Kye Hyang is trying to make Yeon talk, but she refuses. She decides to hand the girl over to the authorities, calling her a thief. Yoon comes out and tells Kye Hyang to let the girl go. Kye Hyang tells about what Yeon did to Choong Il’s face. Yoon says the scratches will heal soon enough. Kye Hyang then takes out the bead and shows it to Yoon. He asks Yeon where she got it and when she refuses to say, he tells Kye Hyang to go to the authorities. Then enters San Daek who is happy to see Yeon relatively safe. Yoon is surprised to see that the girl’s mother is the same woman he found injured. He tells Kye Hyang to never mind and go to her quarters, annoying the woman to no end. San Daek says the bead has been in their family for years when a servant comes and tells Yoon that guards have come. Yoon manages to keep the guards at bay thus ensuring Yeon’s and San Daek’s safety for a little while. 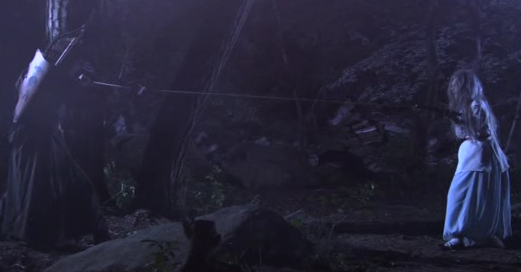 San Daek goes to Yeon who is working at untangling the rope test the shaman gave Yoon. San Daek scolds her for having taken the bead and asks if Yeon will leave her without a word again. Yeon says that she will not and San Daek gives her a bell ornament and tucks it into her clothes, saying that as long as Yeon has that charm, then she will always be able to find her. Yoon comes and offers to let San Daek and Yeon stay until things blow over. San Daek refuses. Meanwhile, Yeon is chasing a butterfly, bell jingling. Cho Ok hears this and crawls out of bed looking for the source of the sound. She later has a seizure and San Daek uses pressure points to help ease the girl’s suffering. All of a sudden Cho Ok pops up, eyes opened and she immediately sees Yeon! After Yeon and San Daek leave, Cho Ok reveals that she heard a bell that called to her and then when she opened her eyes, she saw the girl hanging on to San Daek. Yoon puts two and two together when he recalls what the shaman said. His servant comes to find him and shows Yoon that the rope puzzle has been completely untangled. This makes all doubt leave Yoon’s mind. He immediately sends people after Yeon and San Daek. It is then that we learn the rest of what the shaman told Yoon. In three month’s time when Cho Ok turns 10, in order for her to survive, she needs to eat the other child’s liver. Ick. My thoughts: Not a bad drama to start with. My main complaint being Seo Shin Ae’s acting isn’t the best and the fight scene was utterly ridiculous and too fake. Other than that, the acting is good and the storyline is intriguing. In Nine Tailed Fox, gumihos had to eat human liver because their own liver doesn’t regenerate. I wonder if it’s the same here as well? Plus if you injured a gumiho’s liver you effectively killed them. But different movies, different plots, so who knows exactly. I think San Daek should tell Yeon before her tenth birthday. It will help more than letting her experience such things without any prior knowledge. I must admit I was liking the character of Choong Il til he turned a complete 180 and showed himself to be a brat just like Cho Ok. I know being an illegitimate child was especially hard in those times, but that doesn’t give him the right to act like such a holier-than-thou person. Grr. The scenes for episode two makes me things I am definitely going to hate Cho Ok even more.